People are attracted to chocolate and cocoa for its health benefits and therapeutic value that make them an ally to enhance cardiovascular health. Cocoa (or cocoa tree) is a shrub native to the forests of Central and Latin America, part of the “Theobroma“ genus in the Sterculiaceae family. This short leafy tree produces edible beans in pods from which cocoa, cocoa butter and chocolate are produced. 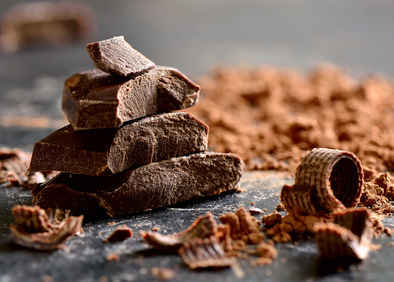 Cocoa is usually connected to better cardiovascular health, but what are the detailed health benefits and properties of this delicious product? 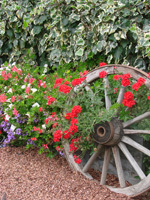 Part of local native diets since prehistoric times, cocoa arrived in Europe in 1528. The cocoa tree was considered to be the tree of the gods. The scientific name of cocoa, “Theobroma” actually means Food of the Gods. Cocoa was grown in 1500 BC by Mezoamerican peoples (Omecs, Mayas and Aztecs). Remnants of vast cocoa plantations 600 years old were uncovered in the Yucatan Peninsula, in Mexico. Chocolate, when produced from cocoa, imparts health benefits related to the polyphenols it contains, which is a group of antioxidants and anti-inflammatories. 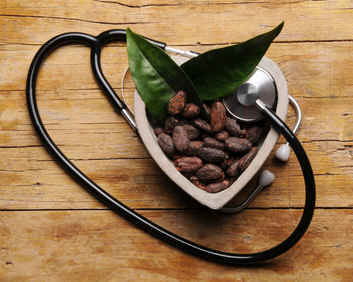 With high levels of minerals (potassium and magnesium), cocoa is beneficial to the cardiovascular system. Much research has proven that ingesting dark chocolate helps lower arterial blood pressure, first of all because of high flavonol levels. The vitamin B3 that is also found in black chocolate also helps remove clutter from the arteries. Cocoa positively impacts the heart: anti-inflammatory effects, increase of insulin sensitivity and reduction of platelet aggregation. Moreover, eating dark chocolate helps lessen bad cholesterol levels in the blood. The most prominent fatty acid of cocoa, stearic acid, is considered to be a cholesterol-reducing agent. Chocolate might also reduce risk of heart attack by slowing the formation of clots in blood vessels. A recent study performed on over 1100 persons thus demonstrated that persons who occasionally eat chocolate have a 27% lower risk of dying from cardiovascular disease. This ratio reached 44 % for those who ate chocolate once a week, and even 66% for those who most ate chocolate. Chocolate is also said to be effective to fight against stress and low energy. With high levels of magnesium, it boasts anti-fatigue and anti-depression activity, while having positive effects on lowering diabetes. It is important to choose dark chocolate which contains at least 70% cocoa so that the polyphenol content is high enough. Indeed, only dark chocolate with high levels of cocoa (70%) can be beneficial to health. To take advantage of cocoa’s positive effects, you must eat moderate amounts regularly, and have a balanced diet on the side. Recommended daily chocolate consumption is 0.3 to 0.7 oz (10 to 20 g), which is about 1 or 2 squares. Be it after a meal, as a small snack or to get an energy boost at any moment of the day, there is no reason why not to indulge in a little square of chocolate. The higher the cocoa content of chocolate, the higher the amount of flavonoids. Eating too much chocolate can lead to gastrointestinal disorders and migraines.